Emberheart was frozen in shock, at least for the moment, as the fox approached Ravenpaw and Dawnpetal launched herself towards it. Oh, StarClan, of all the times to be unable to act, why now? The fox yelped in anger when he felt those claws crossing his muzzle. With a deep snarl, the animal backed off just to face the sandy-coloured she-cat in front of him, who was trying to defend his prey. Angry by his failed attempt, the huge animal launched itself to her and he closed its jaws around its scruff before shaking her viciously. The fox threw her against a tree and before she could get up, his teeth were already sinking into her neck. Her blood filled his mouth and he looked with satisfaction how the life of the she-cat started to slip away under his body. If he couldn't get the smaller cat, then he would take her as his meal for today. Dawnpetal’s eyes widened and a shriek caught in the back of her throat as the world began to agonizingly painfully spin around her. She flailed her limbs, trying to latch onto something, when all of a sudden the air was knocked right out of her as she slammed into something hard on her ribs, hearing a sickening snap of a twig. Was it a twig? She couldn’t really tell, her head was spinning uncontrollably and her side flashed with agony and every breath felt like fire inside her lungs. 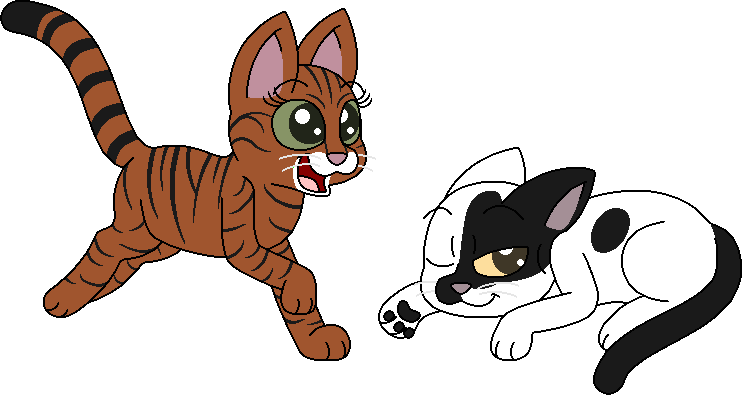 Seeing Ravenpaw lunge for the fox reminded Emberheart that she had to act. That's right, she wasn't alone, she had... She had a mate, she had a daughter relying on her right now. She ran forward with an unintelligible battle cry, reared up on her hind legs and slashed at the fox's face wildly. She wasn't going to let it live long enough to hurt any of them further, not if she could help it. Emberheart used Rear-Up to Slash on the Fox, dealing 13 damage and costing 15 stamina. The fox groaned when he felt those fangs on his neck and he stepped back of the she-cat as he tried to shake off the small cat. However, another warrior showed up and he barely closed his eyes at the right moment to not be blinded by her claws. The huge creature roared in pain and anger and he started to move violently to shake off the apprentice on his back. Fox is pinned for 0 turns. Ravenpaw hissed loudly but couldn´t stay on the fox longer, however, while being shaken, she sunk her claws on one of the fox´s sides to not fall completely and went to attack it´s belly. Emberheart decided to simply continue doing what appeared to be working, and brought her paws down on the filthy fox-hearted fox's head once more. The huge animal growled in pain when those claws slashed the flesh of his belly. Angered by his failed catch, the predator closed his jaws around the body of the smaller cat and he bit it strongly as revenge for his own wounds. Then, he tossed her away to face the other warrior. The fox knew that he was getting weaker but at least he would take down two of them. Maybe later he would try to hunt something else for the rest of the pack. Fox used Iron Bite on Ravenpaw, dealing 30 damage and costing 20 stamina. Ravenpaw is K.O. At this point, Emberheart was on autopilot. Ravenpaw was unconscious, Dawnpetal was hurt... All she had wanted was to bring her family closer together, to make up for her distance. She had never wanted this - any of this. Dawnpetal watched weakly as the fox was finally driven away. She wanted to screech as her beloved daughter had been taken down by the beast, and she felt lightheaded with relief -- well, more lightheaded than she already was -- when Emberheart jumped to her rescue. Now everything was quiet. She found it to be peaceful. But at the same time she found it terrifying. She knew she wouldn't be able to recover from this. But she didn't want to die. Not here. Now like this. She had accomplished so much in life. Finally escaping Buttercup's shadow and changing her name to one unique of her new, permanent home; falling in love with the sweetest, most beautiful she-cat known to the Clans; raising and training her three apprentices, Sunleap, Dappledpaw, and Ravenpaw; and, of course, adopting her dear kit. She had made so many wonderful friends, and she had lost many littermates. A cold jolt shot through her body; Leopardclaw had just finished losing Reedheart. What would happen to him once he knew he had lost a daughter as well, and so soon after the death of his son? Dawnpetal whimpered softly, like a kit who has lost its mother, knowing in a few moments it would die. She weakly opened her eyes and raspily called out to her mate and daughter. "E-Emberheart... Ravenp-paw... I... I w-won't be able to m-make it..." Stars, don't let them interrupt her. Let her say all she needs to, please. "Emberheart... You were my f-first friend I've m-made since coming to ThunderC-Clan. I'm so h-happy to have trained by your side. The battles we've fought, the o-owls we've caught..." A short purr of laughter was cut short by a bout of harsh coughing. "M-My only regret... is that I d-didn't tell you how m-much I loved you sooner... I l-love you so much..."
"Ravenpaw..." Dawnpetal turned her weak gaze to her daughter now. "I am s-so proud of you... I'm s-sorry I can't finish your t-training... But I kn-know you will be the b-best warrior you can possibly be... Take care of E-Emberheart, and you b-both take care of Leopardclaw... He's going to n-need all the support he can get. And Ravenpaw... Once you journey to the Moonstone, pay me a visit if you c-can. I l-love you both so much. I was born Heather, but you two have made me Dawnpetal. I will a-always be grateful." One last bout of coughing shook her body, and she was finding it hard to bring air into her lungs. Her lids were falling, her breathing was slowing, her vision was going black. At least now she would be able to reunite with her lost ThunderClan littermates, and perhaps she would be able to see her biological father and brothers and sisters as well. Her last words came out as a barely audible whisper. "I love you both... Thank you... Goodbye..."
Her eyes fell closed. Her breathing stopped. Everything went black.